Tag Archive | "computer bugs"
Computer Bug Got Ya Down? On Saturday of Labor Day weekend, my Dad – in his mid-eighties – called me to report a problem with his computer. This is not an unusual occurrence, as my nieces and others from whom he solicits technical assistance can attest. He told me that there was an icon-like image of what appeared to be a bird on his computer. (Now, you should know that his eyesight is not what it once was.) The icon appeared – he said – on his desktop, any webpage to which he navigated, and any application that he opened. I did a cursory search on the web and could find nothing (frankly, I had difficulty in formulating a way to describe the problem to enter into the search box). A while later, my Dad called to say that the problem had resolved itself. Ever inquisitive, as he was reaching for a small tape measure on the surge protector on which the monitor was seated (to determine the exact location where the image sat on his screen), he bumped the surge protector and the icon disappeared. Three days later, I got the answer. My Dad called declaring that he had solved the problem. He had taken an afternoon nap and, on arising, had opened the front door. There, on the glass of his storm door, sat the very same icon he had seen on his computer monitor on Saturday! It was (drum roll) an insect!! 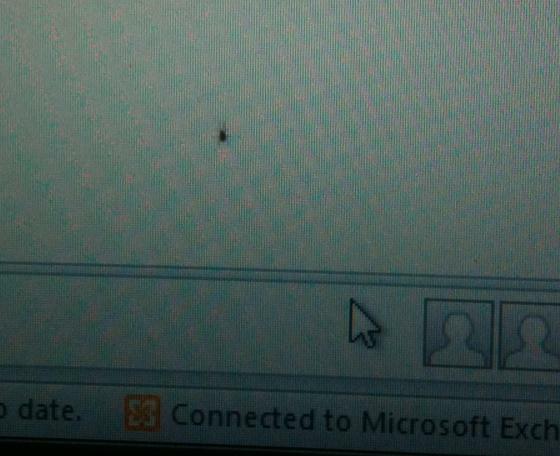 Yes, a real bug!!! – not a computer virus or the nefarious act of a cyber-terrorist. The great white hunter set out to capture the beast, but – by the time he found a jar – the “bird” had flown. But, fortunately, he did get a picture (below). He’s currently putting out an APB.